The series "Kidding" shows us the struggles of being a public persona when your private life is a mess. Jeff Pickles (Jim Carrey), has been the host of a children show that spreads message of love and understanding to everyone. But, it would be impossible to show that world without actually creating it. "Mr. Pickles Puppet Time" may start in Mr. Pickles living room but it comes to live when his friends show up. We all remember and probably grew up with Sesame Street, so it's no wonder Dave Holstein - the creator of Kidding - hired the Sesame Street head-writer Joey Mazzarino, to help create the puppets that will help Jeff reach out to children. "It's more beautiful than walking onto the set of, say, a sitcom you've written, because you're walking into pure magic. It's just pure imagination. You walk in and there's this magical living room. It was emotional, frankly, seeing it for the first time. It's a place that attempts to make someone's childhood better and that's a fun place to work. We really wanted to build a children's show that could be a legitimate children's show because it meant that our character Jeff was sincere. He is not something you usually see on premium cable, which is a main character who is just kind and doesn't want to kill hookers. And to sell that reality, we had to write a love letter to children's television and not make a cardboard version of it", said Dave. To be able to make the children show believable, Holstein ask the writers if they knew someone who had work on Sesame Street not only for " the sets and the puppets, but also the language you use when talking to children on television," since "there's a real specificity to what you do or don't say," and they "wanted to make sure", they, " were abiding by that every step of the way." Executive producer Michael Aguilar brought Joey Mazzarino to the show. Joey was a head writer and puppeteer (Murray Monster) in Sesame Street: "I worked with Bob from Sesame Street, whose real name is Bob and so many people know him as the TV icon. And then, he's there just hanging out with you and being a real person," Mazzarino said. "On TV, nobody gets to hear Bob say the F-word, but I do. Not that he curses crazily, but these are real people. I just thought it was interesting to see the difference between what America sees and the real flesh and blood human beings outside of that." The idea for Jeff Pickles to go to Pickle Barrel Fall and met many puppets there, was Mazzarino's who's loves creating puppet characters. But he wasn't the only one. Jim also contribute to it but pitching the puppet character "Oops, a puppet that personifies giving children the permission to make mistakes and added tribal tattoos for Uke-Larry to make that puppet more Hawaiian." "There are little things you'd never notice. Oops is always making mistakes, so the tag on his sweater is inside out and his face is crooked," Holstein said. "Jim had a lot of little details that I really like." All crew of "Kidding" became involved in creating this world: "Really figuring out that structure - each puppet has its own world and they interact through the river system - was pretty amazing. The hyper form of normalcy in the real world and the supersaturated fantasy world need each other to keep things interesting. Otherwise, one just turns into candy and the other is too depressing by itself. I don't think any of us knew how far we would go to flesh out Puppet Time," Maxwell Orgell (production designer) said. Everyone loved the way they came up to get Jim's character into the Puppets world by travelling by a barrel: "There were so many ways it could have been addressed," Orgell said. "It was a rear projection at one point, but it ended up being traditional Michel Gondry. I was so glad we did that instead of going into an animation sequence or something of that nature." 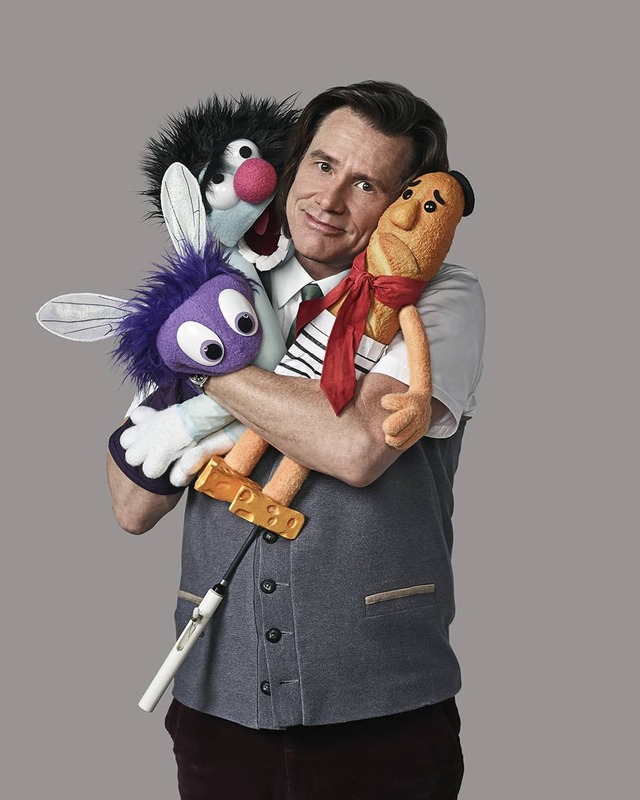 Both Holstein and Mazzarino have said he would like to have a full episode of Kidding to be an entire episode of Mr. Pickles Puppet Time: "It's incredibly emotional to watch not just the world you wrote in a script come to life, seeing a character's house, for example, but seeing a character's imagination come to life, too. It makes it a real person. To see your character's imagination in three dimensions around you, and you're walking through their head as you're seeing all these puppets they came up with, it's a real magical feeling." We gotta say we love the puppets and we would love to see an episode like that.